there are a number of factors you should consider. You need to see how much space you’re working with to start. You might have a need to game in a closet under the staircase or maybe you have a large office area. The larger your surface area the more options you have for monitors, peripherals, your rig, etc. Me personally I find the bigger workspace I have the more I can neglect to take my empty cans of Redbull to the recycling. Sometimes you have to deal with the space you’ve got available. There are good options to consolidate your clutter and give yourself the most room possible. We’ll be sure to include the best options for your tiny spaces so don’t worry! Admittedly there aren’t many options generally marketed to us gamers, there are great choices that’ll add to your experience. 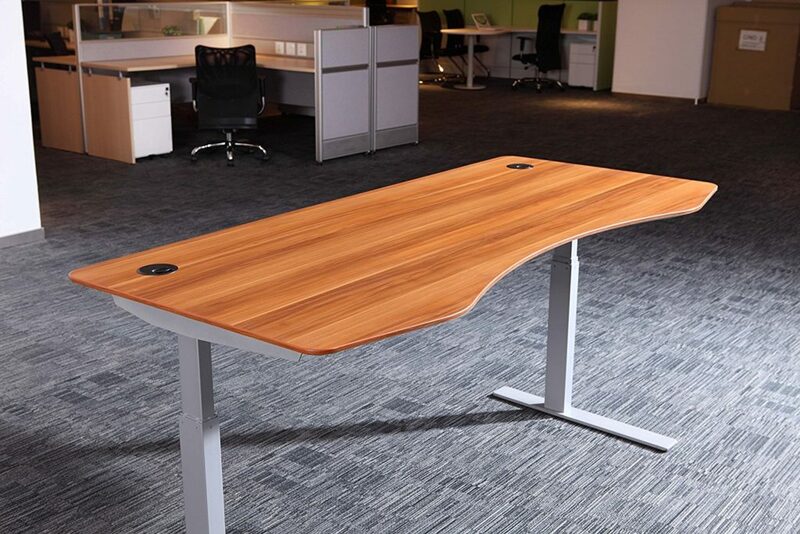 Everything from standing desks, corner desks, L shaped desks and more. In this breakdown, we’ll go over what makes for a fantastic computer gaming desk and keep you under budget. There are a ton of options for gaming desks. Choosing what’s best for you means going over some of the current market designs and the benefits and drawbacks of each. Therefore, that’s where we will start. L shaped computer desks provide excellent working space while not keeping you trapped. Access to necessary accessories around you is easy when you don’t have to stretch for them. The L-shape gives a great amount of space to have your spare laptop, a printer or your meal with ease. 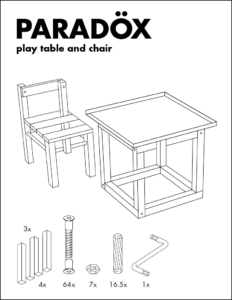 These gaming desks are usually difficult to move and sometimes become a nightmare to assemble. Corner desks are excellent for saving space. Sometimes you have to look at your space available and determine what’s best for the given room. Amidst these desks you’ll find not many have enough room for a full tower case, leaving you with only the option to place it on the floor, a big no-no. Standing desks are becoming more and more popular. But are they right for gaming? Well, to be fair, not really. But you might have heard about them and want to know more about the benefits of them. Sitting for long periods of time can be poor for your back and posture. Check out more about this in our best gaming chairs article. Whatever design will suit your needs will depend on the situation you find yourself needing. Personally, a regular 3×5 rectangle gaming desk works well for me. What other options do you need in a desk? Well if you’re a pc gamer you might have multiple monitors, you might be thinking about a desk mic, maybe VESA mount attachments etc. You also might work on the same PC so you need options for a printer and various office materials. So let’s go over some common options you’ll want to know about. Despite not necessarily gaming related, there are some factors to which makes a good gaming desk. We’ll go over some pros and cons in this section. The most common build materials for computer desks are as followed: steel/aluminum, wood, glass, OSD (Oriented Strand Board). These desks are generally very heavy, cheap, and objectively ugly. While there are exceptions I would consider avoiding these unless you’re on an extreme budget or plan on moving the desk quite a bit. 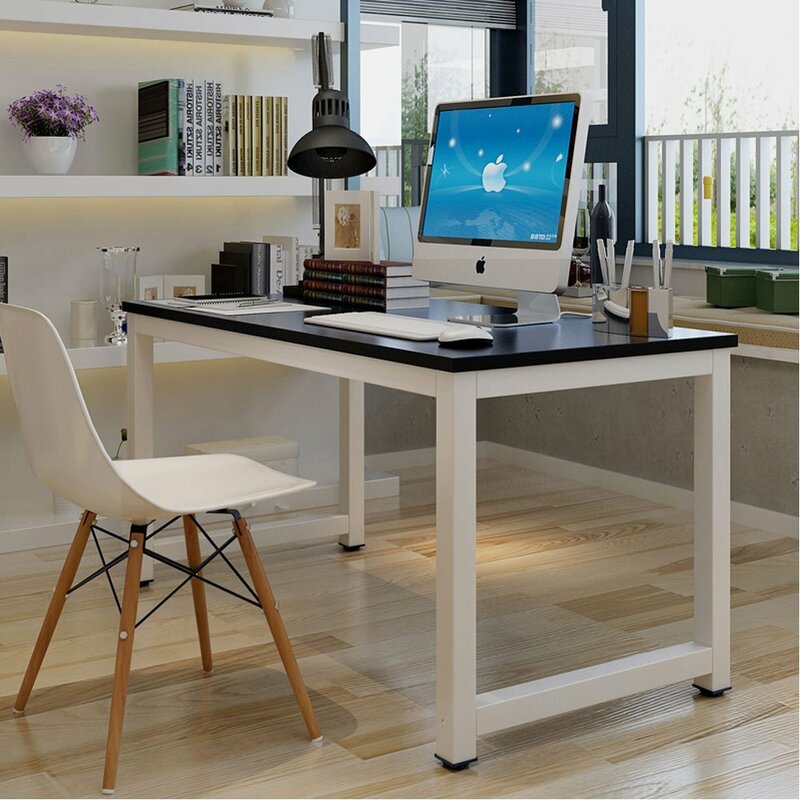 Most manufactured wooden desks are made from pine and are very durable and can last you years. Pine is also very abundant in North America making it a good value proposition as it is cheap. If you’re on a bigger budget you can find custom fabricators to craft you an epic table. Either way, wood is recommended as it’ll give you the highest long term value. Glass can look pretty great if you’re a minimalist or have a design idea for your pc gaming setup, otherwise, the glass comes accompanied with a lot of problems. Glass gaming desks are notorious for collecting dust and fingerprints and are also prone to micro scratches. That is if you don’t manage it to chip or shatter parts of the desk. 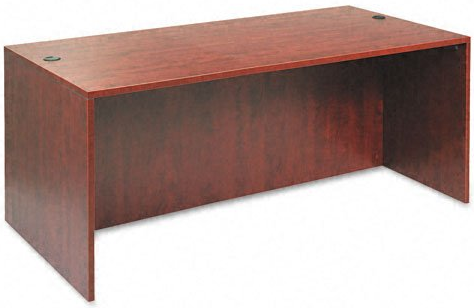 OSD (also known as particle board) desks are the cheapest to manufacture. They often come with a fake wood veneer in order to imitate real wood. Unless you’re on an extreme budget I would avoid particle board as your pc gaming desk. Prone to rapid warping and chipping, OSD has a tendency to fall apart within a year or two. Though it’s common to assume the more you spend the better the quality should be, this isn’t necessarily true. While the material makes a significant impact it’s not the only key factor. Many brands use cheaper methods of manufacturing to keep costs down but consumers end up paying the price. It’s always important you read reviews on specific models to determine if other people have had any quality issues. Okay assembling your pc gaming desk is usually “once it’s done it’s done” kind of deal, however, when it comes to very large desks they can be a nightmare. 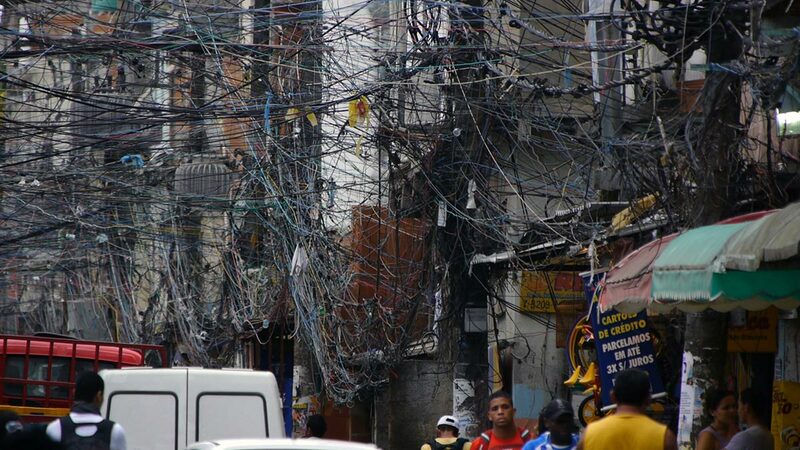 Many of which look like this image. 15 years ago my father had bought one of the biggest most time-consuming disasters I’ve ever seen. As a young ambitious lad, I thought I could knock it out in a couple of hours. Little did I know 1/4th of the assembly materials weren’t included. The takeaway is always checking reviews for specific products to make sure instructions are clear and all parts are included. Okay this one is obvious but the more workspace you have the more comfortable you’ll be, and you don’t be looking around for a safe space for your Redbull. Jokes aside even if you can get away with a smaller gaming desk, having more real estate gives you room to grow (you never know when you’ll get the itch for a bigger monitor). It’s important to keep a good posture when spending long periods of time on your PC. The perfect height will depend on how tall you are. Most surfaces are usually 28” to 30”, which is pretty standard for most people between 5”8” and 5’10”. If you’re shorter or taller you might consider varying the size to suit your need. Coupled with the perfect chair and you should be set. If at all possible pick up an adjustable height desk to suit your needs. Ah yes the most important key determining factor into our perfect pc gaming desk. I should stress that “price” isn’t exactly what I go for when determining this. It’s more about “value”. What can offer us the most value for our budget? Unless you’re an Arabian prince (if you are please contact me I have lots to discuss) the value any desk gives should be your main concern. If you’ve narrowed down your search using these various options and still can’t decide, try to visualize what will make your gaming desk setup look best. What’s your style? Do you plan on moving it often? Do you plan on adding additional monitors in the future? Think ahead and make sure you pick something that’ll give you value for years to come. Here we go boys and girls lets go through our top reviews for gaming desks in varying categories. We’ll start at budgets and work into styles. Let’s turn your sanctuary into a next level entertainment immersion diversion. Okay, so you can’t really ask for much more with this pick. Coming in at just under $100 you get a solid steel rod frame and carbon fiber designed laminate over PVC top. Cool little cup holder and headphone hook. A couple of mini hooks for your controllers and a nifty charging station. It does come with a monitor shelf, although, I personally HATE looking up when gaming. Not to mention it’s really unhealthy for your neck. It, however, could be used as a footstool if you want to repurpose it. For the price of under a Benjamin, there’s nothing better aside from scoring a lucky garage sale pick. This gets the thumbs up. Okay, so there’s not too much to tell about this desk except its durable build quality and a pretty solid amount of workspace. If you’re looking for budget minimalist it’s a solid choice. Coming in just shy of budget you get a heavy duty steel frame and MDF top. If you’re heading to your first year in college, this girl will last you until you leave. It’s the bigger brother to the first in our list and comes with a larger surface area, underside basket, and speaker holders. Basically everything the first one had and more. 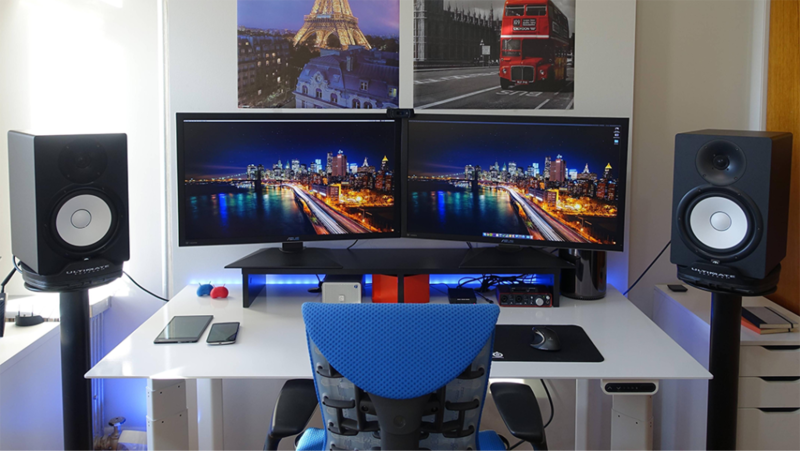 Along with your bigger budget, you get a lot more bang for your buck and it can make your battlestation stand out. Again I’m not a fan of the monitor shelf but too each their own. The underside basket is a bit of a miss, to be honest, it can constrict your knee movement and if you sit with one leg under the other. Okay so she’s not exactly the sexiest gal in the room but wow she sure has the room. A whopping 71 inches wide and 38 inches deep if you’re looking to set up a multi-monitor system this is perfect for you. The is not bad looking and it comes with a few cutouts for cable management, awesome. Not a fan of the OSD but with this size in the price range it’s a give and takes. The “Newedge” as its called, is a damn fine looking desk that compliments their chair series so well if you’re into the look this brand offers. The usable space measures 31.5” X 47.3” so you get some decent working space. 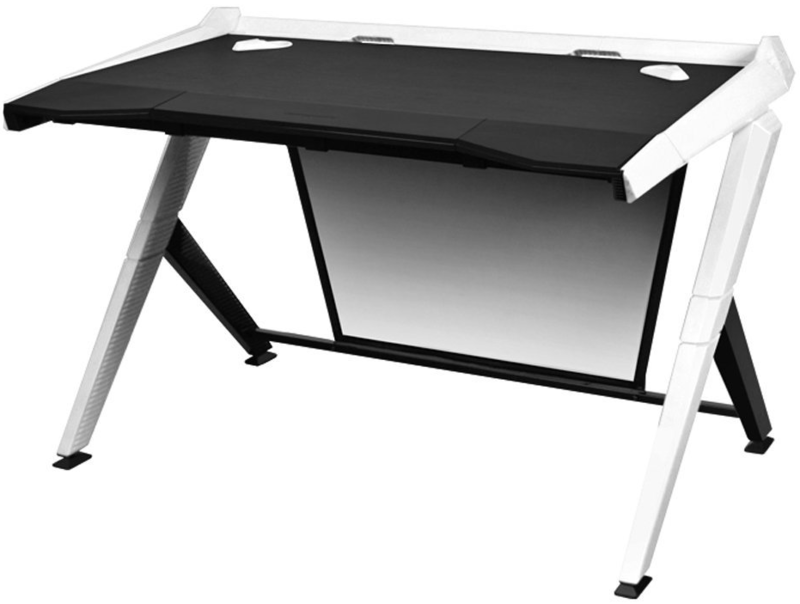 The build quality is fantastic alongside a solid wood top, steel frame and ABS plastic this gaming desk is made to last. Cable management was definitely in mind when designing the desk as there are 4 cutouts to route cords behind with a very nice cf feather cover. My favorite feature is going to be the height adjust, it’s a fantastic plus that accommodates everybody. I will definitely be giving this desk a full review later on. If your goal is an absolute premium gaming desk than DXRacer has you covered. Okay so it’s glass, and I hate the glass, but Techi Mobili decided to frost the top which is a fantastic idea. With the frosted finish, you don’t have to see every speck of dust and finger prints plus the glass is thick! Coming in at a whopping 64.5” x 29.5” you get a great amount of space. The frosted look can really look amazing if you couple good RGB lighting to compliment it. Be aware the shipping weight is 123 pounds so team-lift that bad boy. This gets a thumbs up! Coming in just under 600 bones ApexDesk crafted an elegant ergonomically designed masterpiece. The health benefits of switching from sitting to standing have been researched and it shows considerable improvements to posture and back pain, especially paired with the Herman Miller Chair of dreams. With the highest standard of build quality, the ApexDesk electric height adjustable standing desk is one impulse buy I would never regret. If you’re looking for maximum space and a pretty damn good build quality then I would suggest checking out Bestars full collection on Amazon. 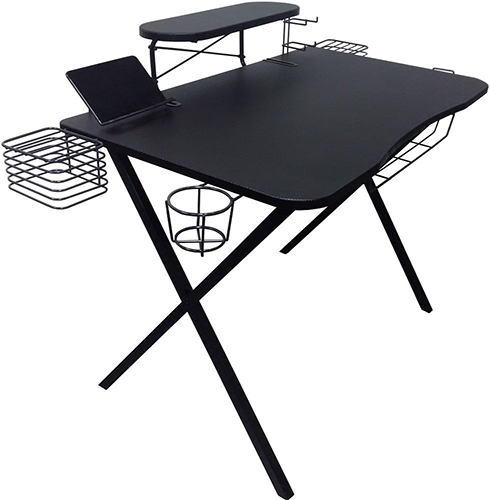 This specific gaming desk has a very pleasing modern aesthetic that can ascent any PC setup. Just make sure you have the room as it comes in at a total of 72” x 93” x 66”. If you have the room, the money, and ambition to put it together then this is a solid value proposition. The gaming industry is thriving and growing every day. 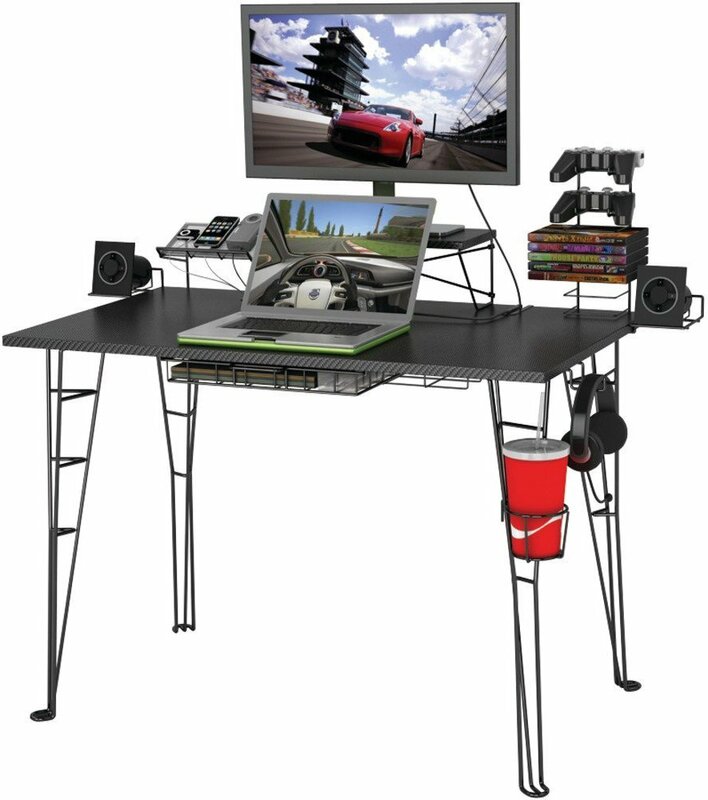 Nonetheless, there’s a noticeable lack of gaming tailored desks on the market today. With how brands stuff RGB lighting into every pc component known to man one could presume there would more companies taking advantage of this. However, I don’t think it will be too long before more gaming oriented high-end gaming desks come to market. With that said if you have any thoughts or opinions on a desk that didn’t make the list feel free to leave a comment and use our contact form and let us know!